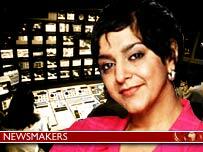 Meera Syal is the woman behind some of the UK's biggest hits, hits which have put Asian faces on our screens and stages. She has written and and starred in the award-winning television series, Goodness Gracious Me, had Britain laughing again in The Kumars at No 42, and penned the script for Andrew Lloyd Webber's hit musical, Bombay Dreams. But Syal hates the term Asian. "It's something you end up saying because it's been used as our collective noun for so long." Born in Wolverhampton in 1962, soon after her highly-educated parents arrived in the West Midlands from Delhi, she was desperate to fit in. "It's very sad but I wanted to be blonde and called Sharon," she recalls. "I was from a culture that was different, there were no positive representations of who I was anywhere." Racism was never a great problem for Syal's family, even though no one shared their skin colour in the rural mining village of Essington, near Cannock, where her Sikh mother and Hindu father chose to live. "The view reminded me of home," was how her mother explained the unlikely decision. Syal will never forget the time she was spat at by a group of youths, but there was never any racism from neighbours, only from strangers. But the clash of cultures was perplexing, an experience depicted in her semi-autobiographical first novel, Anita and Me, released as a film last year. "Fitting in meant forgetting who I was," she says. "I loved talking in a broad Black Country accent as much as I loved speaking Punjabi. "The purpose of the melting pot, it seemed, was to boil all our differences away - the differences that make us so interesting and unique". Syal wrote the screenplay for Anita and Me, co-produced the film and appears in it as the aunt of the screen persona of her own adolescence, Meena. Her parents expected she might become a doctor or a pharmacist. But if she had ever contemplated those careers, her ambitions changed radically when she learned that her mother had cancer and had been given six months to live. Her mother survived, but Meera, just embarking on her studies at Manchester University, was profoundly affected. "If I'd ever been in danger of just moseying along and not taking risks, my mother's illness shook me up. I don't want to wake up at 50 and regret that I never had a go at anything." University life posed more contradictions of identity: "I went to university never having been out with a boy and left exactly as I went in". She said her fatness protected her from the fear of rejection: "I thought if I am not in the running I can't fail." There was also the perceived restraint of her ethnicity. Taking a lover would mean she was "a bad Indian woman", until she visited India and discovered everyone was dating and drinking. After gaining a First in English and Drama, Syal took her first step up the theatrical ladder when she toured fringe theatres with a one-woman show, One of Us, which she devised with a friend from college, Jackie Shapiro. It won her a Most Promising Performer Award at the Edinburgh Festival, after which the offers came in thick and fast. While most of her early acting was on stage, she wrote for BBC radio and television, as well as Channel 4, and a series for Indian television, Paanchi, topped the ratings with each of its 13 episodes. Her big break came when she teamed up with a group of friends from the Asian comedy circuit and devised the BBC sketch show Goodness Gracious Me, which enjoyed instant success when it transferred from radio to television. 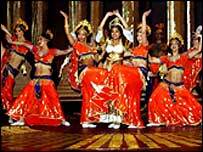 Like her novels, Anita and Me and Life Isn't All Ha Ha Hee Hee, the show's main thrust is to debunk myths and poke fun at Indian traditions. Writing and playing TV's Granny Kumar, Syal draws on a blend of older Indian women she met who changed her pre-conceived image and "shocked me with their frankness and spirit". "I think that cultural schizophrenia made my whole generation sparky and creative", she says. She feels the break-up of her marriage to journalist Shekhar Bhatia has made her less judgmental and more compassionate, although colleagues testify that she has always been open, honest and generous of spirit. Now she is a single Mum, living in east London with her nine-year-old daughter, Chameli, although she would "love to be in a family unit again". 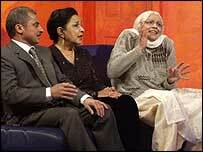 In 1997 she became an MBE and accepts that young Asian stars might now see her as part of the Establishment. But Meera Syall has one plea: "Don't see me as a stereotype - let me surprise you".